Known across the globe for their highly-detailed and beautifully-crafted die-cast model cars, Bburago’s new Junior collection is designed to drive your little one’s creativity and imagination. Such is the case with Bburago Junior’s Lil Drivers, the perfect companion for pint-sized revheads. 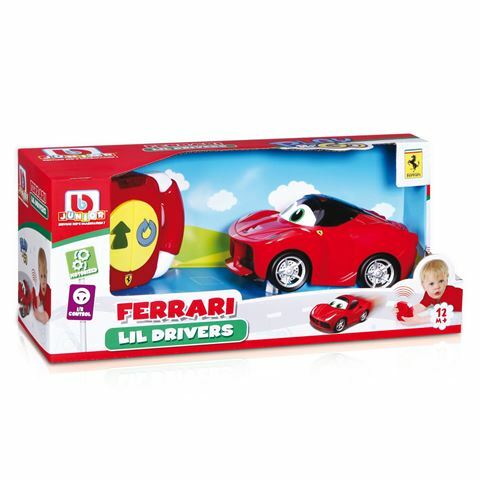 Modelled after Ferrari’s iconic sports cars and complete with two bigs eyes across the windscreen, this compact motorised car can be driven via the included infrared remote that lets you drive both forwards and in reverse while making sharp twists and turns around your bedroom. Recommended for children aged twelve months and up. Crafted from colourful durable materials. Modelled after Ferrari’s sports cars. Motorised car can be controlled via the infrared remote. Drives both forward and in reverse. Perfect for developing hand-eye coordination and imagination. Car requires 2 x AAA batteries (Not Included). Remote requires 3 x AAA batteries (Not Included). Presented in a Bburago Junior box.